We are proud to announce that Cloverpop now provides the only system of record for business decisions, allowing you to track, communicate and improve decisions across the enterprise. 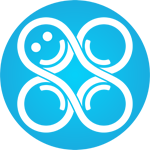 Cloverpop began as a solution for helping companies and teams make better, faster decisions together. We speed up decision-making by allowing stakeholders to weigh in quickly, sans meetings, and by leading users through quick steps to defeat biases, avoid groupthink and find better choices. We’ve spent the past year extending the core product to make Cloverpop a true system of record for your business decisions. You can now use Cloverpop to record and track all of your business decisions. You can easily share the "who, what and why" of those decisions with everyone who needs to know. You can search for and find important decisions. And you can analyze and improve decision practices across your company. With any system of record, it’s important to get your decisions in, so you can track and share them. 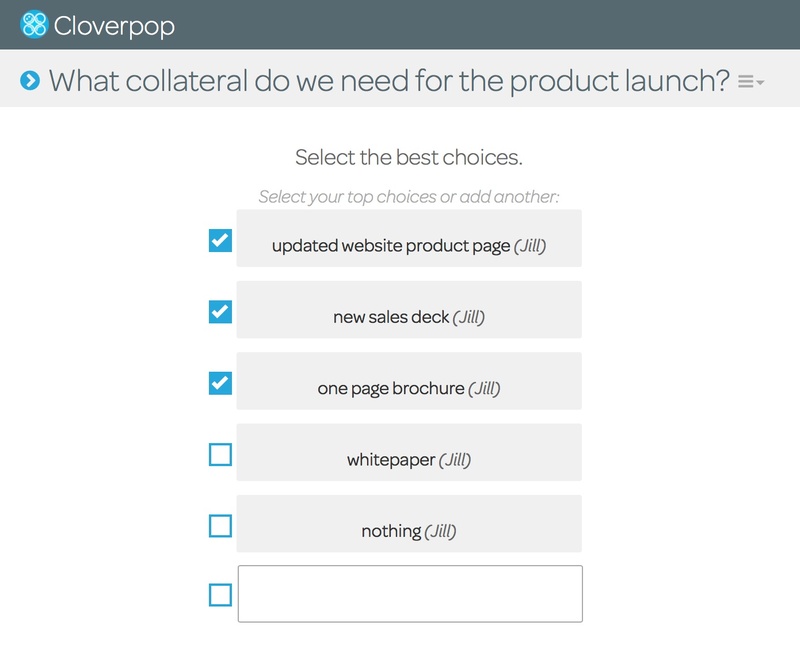 We’ve streamlined decision recording to make it quicker and easier to get your decisions into Cloverpop. In addition to recording from the app you can now record decisions directly from Slack. We’ve also made it easier to find decisions and stay in the loop with tagging and improved filtering. Does your team use Slack and make decisions in the channels? To record decisions form Slack, simply type /Cloverpop record in the message field and you can record your decision right there to make sure you can share and track it. Secret geeky pro-tip: For those of you who prefer free-form typing to filling out form fields, try typing ‘d’ when on the Decision tab the next time you need to log a decision. Organizing your decisions is a snap with tagging. You can add tags to any decisions, either from the decision summary page or decision tile on the decision tab. Tags make it easy for users to find the decisions they care about. Communicating decisions to stakeholders is a critical part of decision effectiveness. There are now two ways to notify stakeholders about decisions. In the “shared with” modal on any decision, you can add individuals or groups to send them a notification about the decision. Users can select whether they want to receive those notifications via email, Slack or Webex Teams. Alternatively, you can copy a link to share in an email, a document or a collaboration workspace. 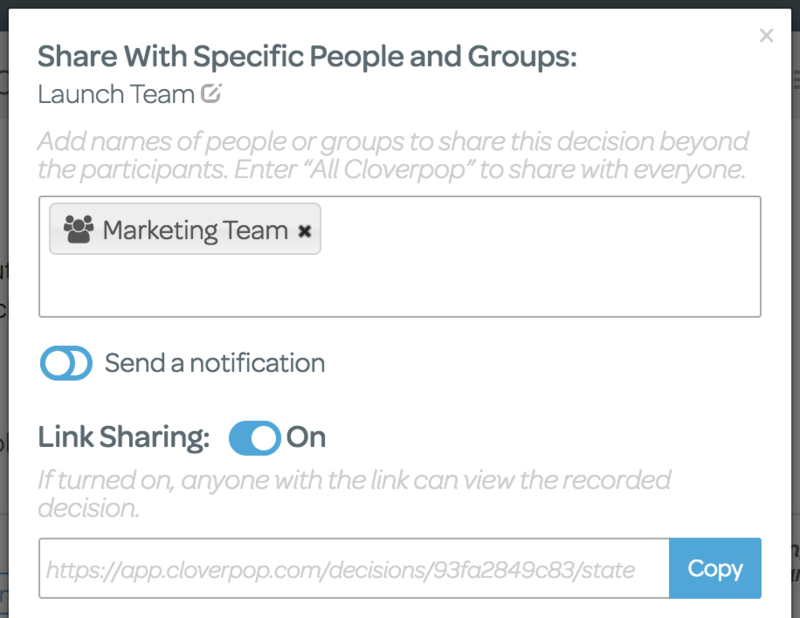 When you turn on link sharing, anyone who has the link will be able to view the decision summary page, even if they don’t have a Cloverpop account. In addition to the existing Guided Decision Flows, we’ve added a quick polling feature and a new AI decision coach to help you improve the quality of your decisions. Quick Polls allow you to take your team’s pulse on an issue with minimal time and effort. Quick polls support 3 types of decisions: pick your top choice, rank a list, and pick all that apply. The AI decision coach suggests specific actions to improve each decision with the least effort. Simply click the “Improve this decision” button on the decision summary page and follow the recommendations. In addition to goal alignment and inclusiveness, the dashboard now provides insight into your decision velocity, results and practices. You can also filter chart data by groups or all decisions made by your org. The decision velocity chart tracks your teams’ decision-making speed, the decision results chart tracks the results of your decisions, and three additional decision quality charts track your decision practices over time. In addition, you can now see how actively team members are driving and participating in decisions. All of us at Cloverpop are excited to help your organizations track, communicate, and improve your decisions. We want to hear from you. What do you love? What are we missing? Please share any feedback at product@cloverpop.com.